Home automation or Smart Home is building automation for the home. It involves the control and automation of lighting, heating (such as smart thermostats), ventilation, air conditioning (HVAC), and security, as well as home appliances such as washer/dryers, ovens or refrigerators/freezers. Wi-Fi is often used for remote monitoring and control. 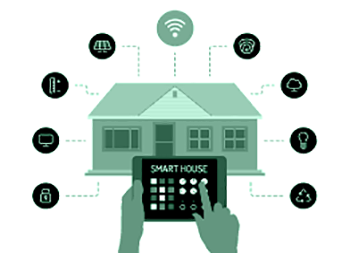 Home devices, when remotely monitored and controlled via the Internet, are an important constituent of the Internet of Things. Modern systems generally consist of switches and sensors connected to a central hub sometimes called a “gateway” from which the system is controlled with a user interface that is interacted either with a wall-mounted terminal, mobile phone software, tablet computer or a web interface, often but not always via Internet cloud services. While there are many competing vendors, there are very few worldwide accepted industry standards and the smart home space is heavily fragmented. Popular communications protocol for products include X10, Ethernet, RS-485, 6LoWPAN, Bluetooth LE (BLE), ZigBee and Z-Wave, or other proprietary protocols all of which are incompatible with each other. Manufacturers often prevent independent implementations by withholding documentation and by litigation. Early home automation began with labor-saving machines. Self-contained electric or gas powered home appliances became viable in the 1900s with the introduction of electric power distribution and led to the introduction of washing machines (1904), water heaters (1889), refrigerators, sewing machines, dishwashers, and clothes dryers. According to a Research Institute, by 2012, in the United States, 1.5 million home automation systems were installed. The above mentioned are some of the key features of a Smart Home. Watch this space for the Latest Trends in Technology.